Photo credit: Adapted by WhoWhatWhy from Wikimedia and Ipankonin / Wikimedia. Democrats performed well in state and local elections in 2017 and held a large lead in generic polls heading into this year. But voters expecting a Democratic wave that wins them the House in 2018 may be in for a surprise. 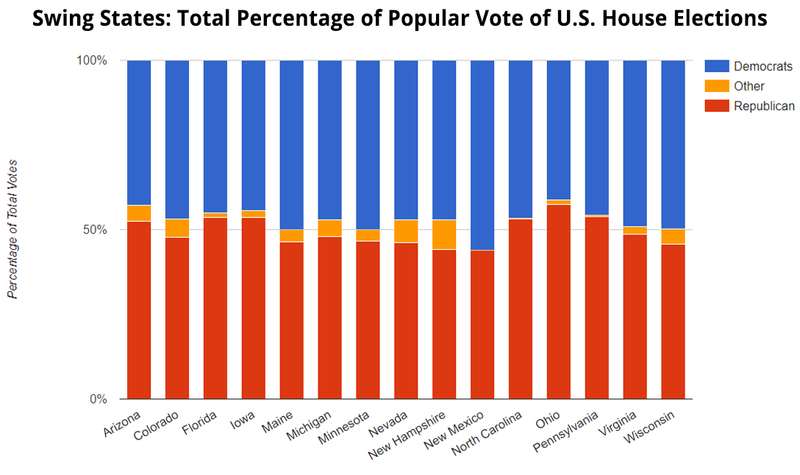 Winning the majority of votes in a state, or in the country as a whole, doesn’t guarantee victory. In 2016, Democrats lost the popular vote for all congressional races in Pennsylvania by a margin of only eight percentage points but ended up with less than a third of the state’s seats (5 of 18). In the past, a House majority switching in the midterms from the sitting president’s party to the opposition is not unusual. It happened most recently in 2010, when the GOP seized control. Just four years earlier, Democrats had flipped the House in President George W. Bush’s second term. However, things have changed since then. The number of competitive districts in which either party has a shot of winning has decreased. Related: What Will/Can the Supreme Court Do About Partisan Gerrymandering? Related: Are Citizens Finally Waking Up to Fight Gerrymandering? According to Cook Political Report’s Partisan Voter Index (PVI), which measures how districts tend to lean during elections, the number of competitive House seats has shrunk dramatically. When the Democrats took the House midway through Bush’s second term, as many as 108 districts were competitive. By 2010 that had dropped to 103. Now, however, as a result of aggressive redistricting, there remain only 72 districts that Cook considers competitive. The way voters behave in presidential elections also informs the PVI. A district that is competitive in presidential elections may not be so in House elections. For example, House Speaker Paul Ryan’s (R) district, Wisconsin 1, is listed by Cook as competitive. However, since he took the seat in 1998, Ryan has won by at least 11 percentage points, and often by much more. If anything, there are probably fewer districts that will turn out to be competitive. In 2016, there were only 21 races in which one party won by no more than 5.5 percentage points. Democrats won 12 of those tight races but they would not have won the House even if they had swept them all. 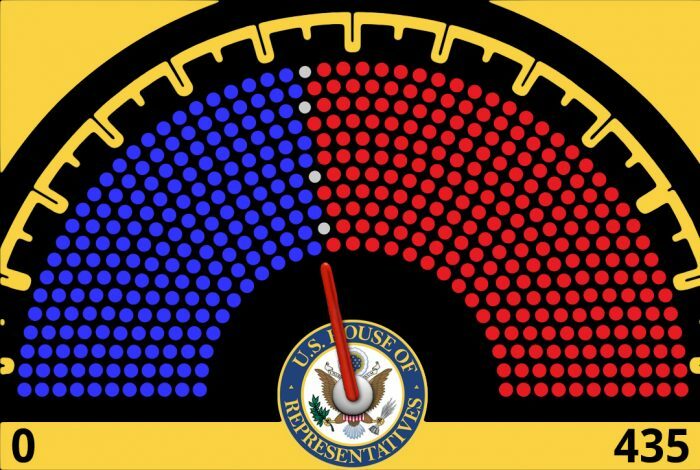 In 2016, Democrats lost the popular vote for House seats to Republicans by a margin of only 1.3 percentage points, yet the Republicans ended up with a seat margin of 10 percentage points. Photo credit: WhoWhatWhy based on data from Office of the Clerk of the US House of Representatives. For Democrats to have gained a one-seat majority in the House in 2016 they would have needed to win an additional 24 seats. By applying uniform rates to the vote counts of each race in 2016, WhoWhatWhy found the point where Democrats could win enough seats to win a majority. With the rate applied, we determined that Democrats would have had to win the popular vote by a margin of about 10 percentage points to also capture the additional 24. Currently, however, Democrats are “only” ahead by about 9 percentage points in the generic polls. The model WhoWhatWhy used does not represent what could have realistically occurred in 2016, but it does demonstrate a point: Republican gerrymandering played an important role in preventing Democrats from winning more seats. 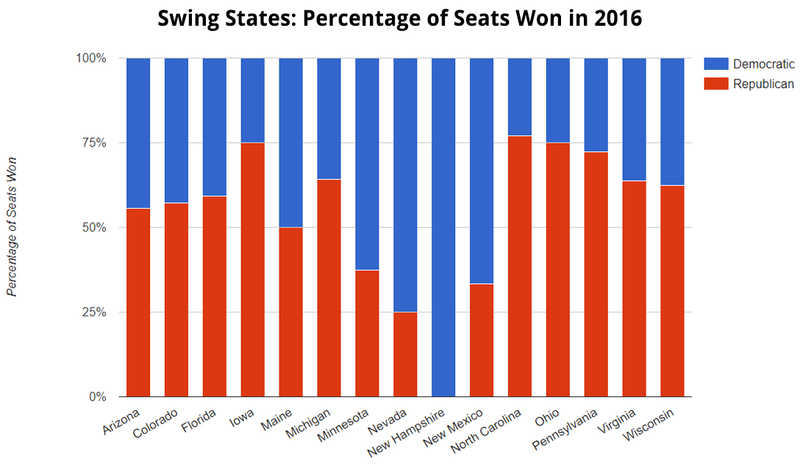 In swing states like Wisconsin, Michigan, Pennsylvania, Ohio, North Carolina, and Virginia gerrymandering may have cost Democrats as many as 14 seats in the 2016 election. This year the US Supreme Court has taken on gerrymandering cases for Wisconsin and Maryland that could have a major impact on partisan gerrymandering in the future. Maryland is an example of a partisan gerrymander by Democrats. A decision against the state’s District 6 would have far-reaching effects for partisan gerrymandering nationally; if redistricting is ordered, Democrats could lose a couple of seats in the state. However, rulings in recent court cases bode well for Democrats in several swing states. In 2015, the Florida Supreme Court ordered the state’s congressional map redrawn by an independent coalition that included the League of Women Voters. This resulted in a more representative outcome in the 2016 election. The US Supreme Court ruled in 2016 that the Virginia legislature unlawfully considered race during the last redistricting. As a result, the state’s 3rd and 4th districts were redrawn prior to the 2016 election. This led to Democrat Donald McEachin’s taking a seat that had been in the Republican column since 2001. However there have been no other substantive challenges to Virginia’s map; it still gives Republicans a partisan advantage. The Pennsylvania Supreme Court ruled in January that the state’s congressional map was unconstitutional and released its own map in February. Experts, such as David Wasserman of Cook Political Reports, agree that the new map fixes the Republican gerrymander and increases the Democrats’ odds of gaining more seats. It remains to be seen if legal actions throughout the country will allow all of these maps to remain in place or force other states to also redraw their own. Earlier this year federal judges struck down North Carolina’s map for unconstitutional partisan gerrymandering. However, the Supreme Court has temporarily blocked the lower court’s ruling and has not yet decided whether it will take the case alongside its other two partisan gerrymandering cases. This could mean the map, which state Rep. David Lewis (R) admitted to drawing to favor Republicans, could still be in play in the upcoming midterms. In May, voters in Ohio will vote on a referendum that will determine how the state handles redistricting. But it does not appear that Ohio’s heavily partisan congressional districts will be redrawn until 2021. This means that for the coming midterm — and the next presidential election — Ohio voters will have to deal with a map that gave Republicans 75 percent of the state’s seats, even though the GOP won only about 57 percent of the vote in 2016. With wins against partisan gerrymandering, Democrats have the best chance of taking the House since the last round of redistricting occurred. However, there is no guarantee that getting the most votes will get the job done. Related front page panorama photo credit: Adapted by WhoWhatWhy from map (Storyblocks).